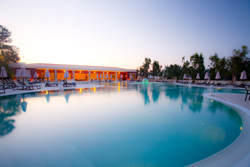 The Alkyon Resort Hotel & Spa is considered the leading five-star hotel in the area and is conveniently located in Peloponnese near Corinth, just 100 km from Athens Airport and 120 m from the lovely beach of Vrahati with fine pebbles and clear waters. 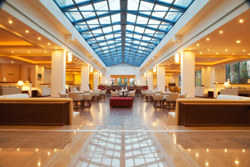 The hotel is located near unique archaeological sites, beautiful beaches and the mountainous region of Corinth, convenient for getaways at all seasons of the year. Discover Ancient Corinth museum, browse the castle trails Acrocorinth, the largest castle in Peloponnese. Visit the lake of Stymphalia where Hercules achieved his sixth labor and follow the wine road from Vrahati to neighboring wineries of Nemea . 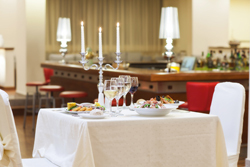 The luxurious Alkyon Resort Hotel & Spa complex, consisting of 12 buildings with 139 rooms and 26 luxurious suites, offers guests the opportunity to choose from a variety of room styles with all the modern amenities that provide a sense of relaxation and complete serenity and ensure a comfortable and top-quality stay. Enjoy the hospitality and experience your senses at all hours of the day with the sky light that penetrates the impressive atrium which dominates the center of the lobby. Close to the reception is the Internet Corner provides service 24 hours a day. Relax in the comfortable lounge, enjoy aromatic coffee or your favorite drink at the Sky Bar and taste delicious breakfast, lunch & dinner at Sky Bar Restaurant. 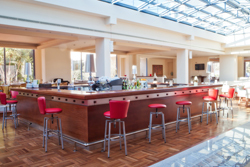 During the summer you can relax and enjoy a refreshing cocktail or a light meal at the GP Bar next to the spectacular pool. The award-winning SPA CENTER’s facilities include: Indoor heated pool 18x5m, Heated Jacuzzi of a 6 person capacity, Turkish bath, Hamam, 2 Saunas, Spa jet, Relax area, Gym, Anti-Aging department, 5 individual treatment cabins, Spa Suite, Aromatic whirlpool bath, Hairdresser , Spa Boutique. People with disabilities: rooms and access to all areas. 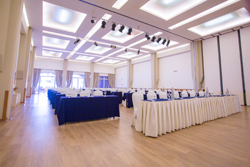 Alkyon Resort Hotel & Spa offers fully equipped, aesthetically pleasing halls with great flexibility while also providing quality services to help guarantee the success and prestige of any professional event. 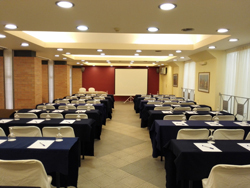 Today, the conference facilities of the complex include 5 conference rooms covering a total area of 1,700 sq.m. All meeting rooms, each with its own style, can meet the demanding requirements of conferences and business meetings all year round. 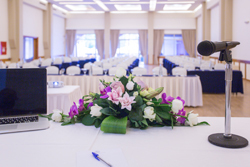 Fully equipped with state-of-the-art media and most featuring natural lighting, the meeting rooms ensure the best possible outcome of any gathering from a small meeting to a conference with maximum capacity of 630 guests.